Description: Hero Arts Rubber Stamps are wood-backed with American maple from sustainably-managed forests, they use all natural rubber, and are cut and assembled by hand in the USA in a solar-powered, green-certified facility. Not to mention that they have great graphic designs and a myriad of themes. 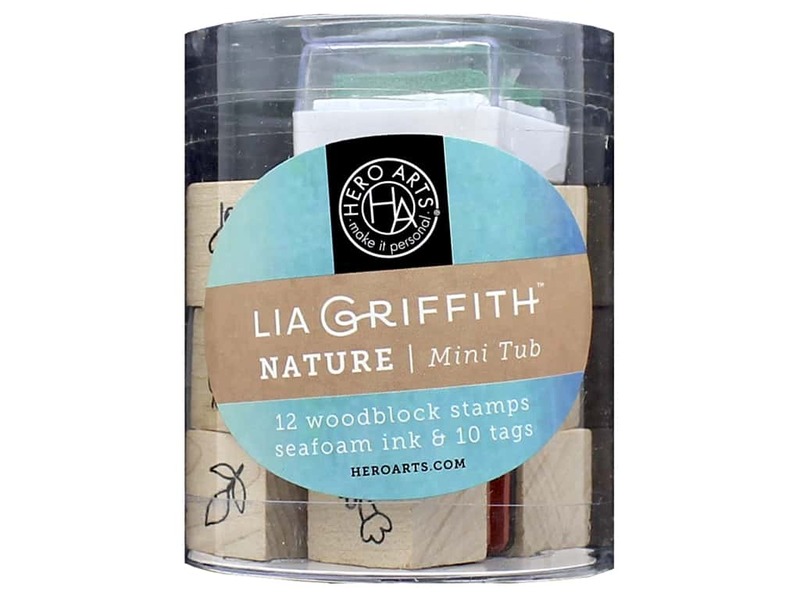 Mini Tub by Lia Griffith Nature- 12 rubber stamps with wooden block handles, images include graphic icons of animals, flowers, leaves, mushrooms and others along with words. Each stamp measures about .75"x .75"x 1". Also included is a small Seafoam ink pad in a Clear plastic case along with 10 White oval string tags. See more Hero Arts Rubber Stamp.